Twenty miles northeast of here is Spade Ranch headquarters, a National Register of Historic Places site. In Ellsworth are the business offices (built c. 1890) and home (built 1902) of cattleman Bartlett Richards (1862-1911), a Vermont native. Richards, brothers DeForest and Jarvis, Will Comstock, Charles Jameson, and others began assembling the Spade about 1888. By 1900 its range comprised some 500,000 acres, principally in the most rugged Sandhill areas of Sheridan and Cherry counties. Much of the land was in public domain subject to homesteading. Farmers who tried to cultivate Sandhill homesteads usually failed, and in the 1890s the Spade illegally fenced the almost uninhabited land, drilled wells, introduced Hereford cattle, constructed trails, and built telephone lines to ranches and towns. Spade acreage shrank after 1905, when Richards pleaded guilty to fencing government land. After unsuccessful federal court appeals from a 1906 land-conspiracy conviction, Richards was imprisoned for one year at Hastings, where he died, aged 49. Today the core of the Spade is owned by the Bixbys, associates of Richards since 1908. That the ranges remain cattle country today attests to the vision of early Sandhill ranchers. 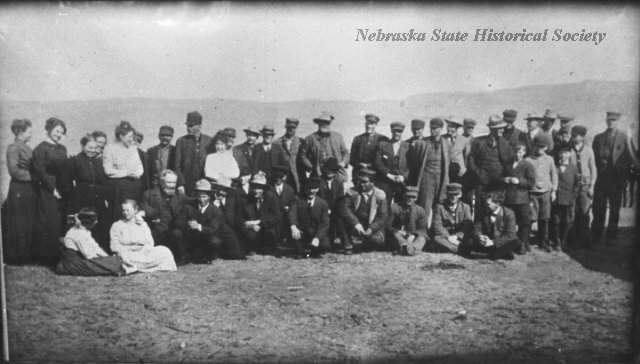 “Spade Ranch,” Explore Nebraska History, accessed April 18, 2019, https://mynehistory.com/items/show/477.